In the interests of anyone who hasn't visited this long-term - at least 20 years - culinary fixture on Uxbridge Road, four of us (two under-16s insisted that their contribution to this review would be invaluable) booked a table and went down to the West End (of Uxbridge Road) for a treat. It's reassuring to see that Lawrence, the son of the original owner, is still in charge. Even at 7.15 many of the tables were already occupied, one of them by a large party of Chinese. If you are going in a large-ish group, you can sit at a table with one of those revolving circular centre bits which I find nerve-wracking as my greedy family can get a bit over-enthusiastic with it. The background music (always the same) is quietly providing a soothing sort of piano-muzak - perhaps it's a Chinese Richard Clayderman - and if you stay long enough you can listen to the whole thing twice. That, along with the linen napkins and table-cloths make you feel as though you should probably be on your best behaviour, although I did notice another family were doing their best to drown out Richard with renditions of a couple of nursery rhymes. Encouraged by a couple of Tsing Tao beers, Diet Coke and fizzy water, we decide to be really adventurous and try a couple of starters we haven't eaten before: glorious-sounding Steamed Jade Dumplings (filled with prawns and Chinese chives) which are delicate and delicious, and Grilled Dumplings which are rather slippery in texture with a greasy meat filling (probably not something we'll try again). We also munch Smoked Chicken and Seaweed (tossed with garlic and coriander) - always very good - and some wonderfully tender Barbecued Spare Ribs (finger bowl provided). Each dish was delivered separately which adds to the general excitement of the meal as everyone tastes everything (apart from the fuss-pot 15-year-old). We then shared half a Crispy Aromatic Duck with extra pancakes which arrived just in time to silence a heated 'my starter was better than yours' discussion. I'm the only female in our house (apart from the dog), so competitiveness is unavoidable. The North China is known for this dish, which I would rate as 8.5 on the crispy duck scale of 1-10. You would think that we would be stuffed by this point, but even after 3-4 pancakes each we still managed to consume Shredded Beef in Chilli (quite crispy and tasty), Chicken Fried Noodles (copious, filling), Ginger Onion Prawns (succulent and well-flavoured), Chicken and Cashewnuts in Yellow Bean Sauce (an old favourite which doesn't disappoint) and some Egg Fried Rice. By this stage our pristine white table-cloth had a new look which prompted a 'who has the most mess around their plate?' competition. 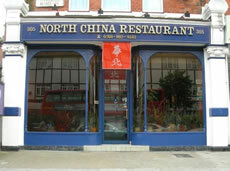 The North China isn't a bargain (a blow-out for two would probably come to around £45 including drinks and service) but it's reasonable, good, reliable food. I'm encouraged by the Steamed Jade Dumplings and would like to try more off-the-beaten-track dishes. They also do take-away which is still good (and I admit it still tastes good late at night heated up in the microwave if you're home long after everyone else) but you'll enjoy the food more when it's freshly cooked at 305 Uxbridge Road, W3.